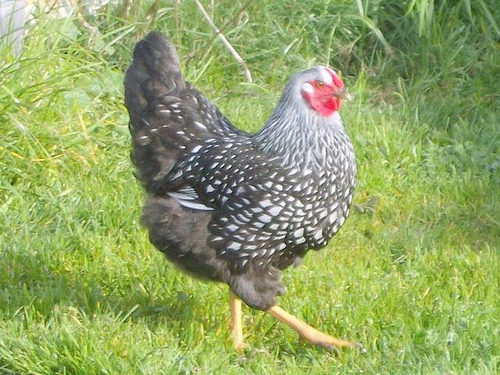 Wyandottes are excellent egg layers, a quality easily seen from the hen’s body shape. Trusting and rather friendly, Wyandottes make for easy chickens to care for, especially for those that just want a few tame chickens to have around the farm. The breed looks much heavier than it actually is due to the bulkiness their feathers suggest. As mentioned, Wyandottes are very friendly birds who get along well with people. They’re easy to tame, easy to train, and easy to maintain. The hens are very good at caring for their chicks as well. They are strong birds, but fairly lazy when it comes to a desire to fly, so they are easily fenced. 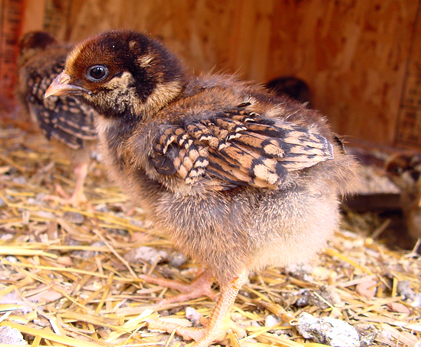 Wyandottes are large chickens with round shaped bodies and very pronounced feathers. Their tails point up a bit and look like an upside-down V when viewed from behind. Their heads are round and short and have bodies that look like they’re very low to the ground due to how full their feathers look. They have very strikingly red facial features with a rose comb, red eyes, and red ear-lobes. They have yellow legs. Wyandottes are very simple to keep happy and healthy. They need some space to run around but won’t try and fly over fences. The hens do tend to become broody rather often, so take care to give them personal space when need be, otherwise the Wyandotte is a very simple chicken to keep. The Wyandotte’s exact origin is hard to pin down, but we know that the first accounts of the Wyandotte breed comes from around the 1860s. 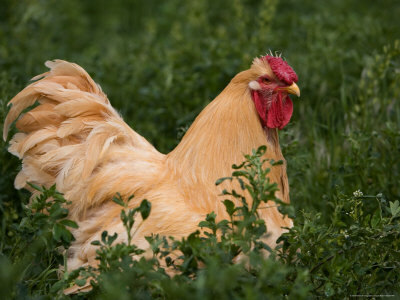 First known as ‘American Sebrights’ and ‘Excelsiors,’ the Wyandotte can most likely be traced back to the Cochins as a likely breed to be bred from. The name ‘Wynadotte’ comes from the name of a ship, specifically the ship of an early breeder’s father.